Campaigns allow you to set different rewards with different messaging for your affiliates, influencers and ambassadors. For ex, your basic affiliates may have their own campaign with a specific reward(like $50 reward per sale) and your influencers(persons of high authority in their fields) may have 25% recurring commission. 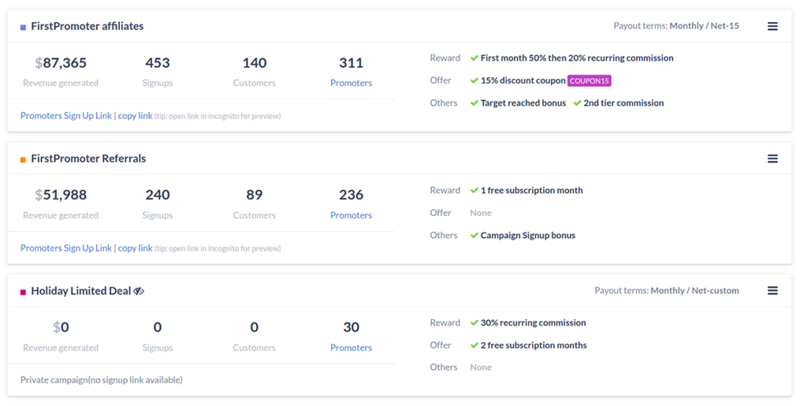 Each campaign has its own set of emails, its own promoter signup page and promoter(affiliate) dashboard. All your promoters(affiliates) are linked to their corresponding campaigns through promotions. A promoter can have multiple promotions meaning they can run multiple campaigns at the same time, each having a different referral link. For ex. a promoter can run both "Referral program" campaign and "Affiliate program" campaign, with different type of rewards. You can also create private campaigns for specific events, like limited time deals or conferences and invite only specific affiliates. When should I create multiple campaigns? You can set up multiple campaigns when you need to give different rewards to a different group of promoters like in the example above. If you have only about 2-5 promoters for which you want to give a different reward/offer, you don't need to create a new campaign, you can customize the promotions linked to those promoters and set the rewards and offers you want. Click here to learn more about managing multiple campaigns. How can I test new campaigns I create? Is there a sandbox mode?